90% This 20.1-inch multimedia monster offers just about every feature under the sun, including an HD-DVD drive. The Acer Aspire 9800 is an all-in-one multimedia machine that packs an Intel Centrino Duo processor, a massive 20.1-inch display, a powerful Nvidia GeForce 7600 graphics card, and an integrated HD-DVD drive into one very large package. This desktop replacement gives you almost everything you'll need for a killer multimedia experience, except easy portability. First things first, this machine isn't for the feeble. Weighing a hefty 17.2 pounds, the Acer Aspire 9800 rides shotgun with the Dell XPS M2010 as one of the largest laptops ever; the display alone is thicker than some notebooks. The entire system is 2.4 inches thick. Even if you think you've seen some large laptops, nothing quite prepares you for the size of Acer's Aspire 9800. It's not so much a desktop replacement as a desk replacement. The reason for its huge size is the fact that it has a 20-inch screen. Yes, that's twenty inches. Measuring 490 x 380 x 60mm (W x D x H) and weighing in at a hefty 8.5kg (including the huge power brick), there's no way you'll be lugging this monster of a laptop around. Powerful and well featured, the Aspire 9800 is the ultimate in desktop replacements and, given the size of the screen and what you get in the box, it's almost a bargain. Just don't expect to be able to carry it around with you. The Acer Aspire 9800 is one supersize laptop. Weighing 17.3 pounds (without its AC adapter) and featuring a 20.1-inch display, it sounds ridiculous to call the computer a laptop. Yet there it is: a screen hinged to a keyboard deck, like any other laptop--except a lot bigger. We've seen large laptops before, and they all have some feature that sets them apart in the portable realm: the 19-inch Eurocom M590K Emperor boasts two graphics cards, while the 20-inch Dell XPS M2010 has a detachable Bluetooth keyboard and a handy travel handle. The Aspire 9800's claim to fame is its built-in HD-DVD drive, making it one of only two systems we've seen to support the new format (the other being the Toshiba Qosmio G35-AV650). And its case is stocked with some pretty high-end components that should make for a decent multimedia experience, whether you're watching or editing movies. 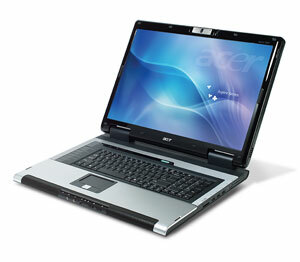 There’s no doubt that Acer has created the ultimate desktop replacement notebook in the shape of the Aspire 9800. It’s powerful, feature rich, has a stunning screen and isn’t overly expensive for what you’re getting. It’s not really my cup of tea (if I drank tea that is), but if you need all of your IT and AV needs wrapped up into one, admittedly large box, the Aspire 9800 should suit your needs perfectly. Price wise the Aspire 9800 series will start at £1,399 including VAT for a machine similar to this one, but without the second hard disk. The price rises to £1,699 for a machine specced with two 100GB hard drives, a 2GHz dual core CPU and 2GB of RAM. That’s not bad value for money considering what you’re getting, but ultimately, you have to really want a machine that can handle all your computing and AV needs to consider this Acer.